An orcish veteran, surveying the field and his slain foes. The orcs are one of, if not the largest fighting force currently in existence in the universe, a power in numbers and strength left in a much weaker form due to their race's fractured society, one of the few races as highly divided as humans. Orcs, by most races, are viewed as bloodthirsty monsters with no purpose other than to kill and maim. While this is incorrect, the judgement of orcs is well-founded regardless - orcish warbands are well-known for their pillaging and enslaving. Orcs are on official record as being involved in more wars as a race than any other. The Orcs are also known for making decisions one could consider as "Bad" in that their military campaigns have often railed for many months against targets simply too strong and fortified for them to easily break, winning the battle only to gain heavy losses that cause their army grievous losses, causing them to lose their next battle. Many tacticians of other races consider them as stupid as a result, - more experienced tacticians know it is simply the way of the orc. Orcs are large and strong, one of the bulkiest creatures in the universe. Their muscles are surprisingly malleable, defying normal muscle mass in how easily they're incorporated within their form, allowing them to have huge builds unfeasible for most warriors of other races while not sacrificing speed. the average orc stands at 6'5 and is strong enough to stop a charging ox head-on without giving ground. Their main physical weaknesses lie in their dexterity, as their fingers are thick, and they're physically incredibly heavy, weighing between five and six-hundred pounds on average, with particularly meaty orcs being as heavy as seven or eight hundred pounds. Their blood is somewhat more viscous and slower-circulating than the average humans, but the average orc ends up heating up during combat, causing the sudden "berserk" look of Orcs in combat - the sudden quickness and activity from the orcs originating in this pre-battle heat. This causes poisons and drugs of many types to work slower on an orc, many not working at all. The average orc also possesses 2 livers, allowing them to drink incredible amounts of alcohol and deal with large amounts of toxins in food, allowing them to eat things poisonous to other races due to their incredible tolerance. Their skins tend to be green due to their preference for plains and forests, but the coloring tends to change to whatever would camouflage them best in their environment after only a few decades of evolution, making brown, red, black, gray, or even blue orcs technically possible. The only truly impossible color for an orc seems to be white. Their facial features vary from orc to orc, but always include fanged teeth, tusks, large noses, and pointed ears. Some have claimed orcs are related to elves as a result of this last, but the theory is not popular for obvious reasons. features such as horns, pig noses, and canine eyes have been observed in Orc magic users that practice demonic magic, however. Besides their lack of dexterity, orcs have several weaknesses. First and foremost, their incredibly heavy frames are not actually buoyant, rendering orcs unable to swim. Secondly, their weight also works against them in that it's difficult for them to jump even as high as a human can, though their long jumps can be surprisingly effective. Lastly, their necks only turn 45 degrees in any direction, their thick necks allowing no more movement than that. While many different societies of orc exist, the one major focus in all of them is strength: To have more strength and skill, means you can control anything weaker than yourself. One orc may fight another over the ownership of a house, for instance. While strength is considered to include such things as martial skill and intelligence, "Dirty tricks" are simply frowned upon in orcish society, and assassins even moreso. The Orcish people believe that the strongest should rule at the top, leaving the weaker society to sit at the bottom. Despite this, however, day-to-day life of the orc people's tends to be surprisingly peaceful, with such challenges normally kept in reserve - orcs have high respect for their own kin, and many older orcs are allowed to keep their positions on the basis of their wisdom and experience, younger orcs purposefully avoiding a challenge towards them, even if they would likely be the victor. This is rooted in their view of strength as well - what may make an orc individual strong is important, but also important is what makes the community strong as a whole. To that end, orcs consider themselves the strongest race alive, and often aim to prove it by destroying the other races, showing their power and superiority. An orcish warband - normally led by a warchief elected through a wrestling competition with the finest orcs of the group - leads his people to attack just about anything that isn't an orc city. The orcs generally do not kill unarmed opponents - though it's not necessarily frowned upon either - they're very apt to enslave the inhabitants, bringing them home for labor and for the dexterity the other races show with their much thinner fingers. While orcs work their slaves ridiculously hard, it's actually very rare for them to treat their slaves abusively or for them to work someone to death - their idea of slavery is done as a resource rather than a humiliation tool, and is rarely used to sadistic ends in orc society, though it is not unheard of. There is one exception, however - the goblins. The orcish governments themselves are democracies, each village governing itself. Countries of orcs only appear when an orc of unusual ambition, or an orc wishing to expand his race's territories, appears, fighting the strongest of each village himself in order to unify them into a united fighting force. This orc is called the Great orc for the duration of his reign, and is given more respect than any other orc. The only other way a great orc can come into being is during a time of crisis when the orc race as a whole is in danger of being snuffed out, at which point one is elected immediately by the villages. The magic practiced in orc areas varies - the only guarantee is a lack of purely arcane knowledge fueling orcish magic and doctrine. While it should not be technically impossible, while there have been many orcish shamans and warlocks, there has yet to be a mage. the magic tends to be broad, and focused on such elements as earth, shadow, and flame, with air being only somewhat uncommon. Most of their magic is focused on improving the strength and resistance of their soldiers, and orcs are particularly good at dispelling the magic of others. The orcs exist in great numbers, so while their magic users are rarer per-person than any other race's, they have the same number of magic users as most other races with such segregated positions. The Orcish military tends to look much less dangerous on a shallow view, seeming to be a disorganized and inefficient mess. This is at the least true on an individual level, as Orcs hold no true organized army, instead coming together in warbands when the situation calls for it, and while they train in combat daily, no true discipline is really maintained amongst their ranks. While it's rare to see orcs rout, it's common to see disorganized squads of orcs getting in each other's way during combat, a weakness commonly exploited by the other races. Most younger orcs wear lighter leather armor - this is in part due to their races holdings not including many mineral resources and the orcs overall tendency to avoid the underground making metal hard to find, but also has a cultural element. Orcs are expected to armor themselves with pieces of the armor they find in the field as "Trophies" of their accomplishments. Most orcs that survive their first combat end up with a hodge-podge of different armor pieces. True veteran orcs, however, manage to gather enough armor to bring to an orcish blacksmith. While orcs do not mine, they are adept at melting down metal and then creating potent alloys from what they've melted, to the point even alchemists occasionally scratch their heads at this. Orcs that give their cobbled-together armor to a blacksmith soon gain a set of armor with wicked angles, thick plating, and a durability matched only by the best blacksmiths of other races, made with practicality and effectiveness and without worry for petty baubles and inscriptions. Orcish weapons are made similarly, though the advancement of the technology of other races has caused even the greenest of orcs to get proper weapons taken from the battlefield, rather than, as the old ways dictated, using more pieced-together weapons of wood, stone, or bone. Warfare has simply become too evolved for such inefficient weapons. The orcish warchiefs are rarely formally trained, but most orcs have an instinctive grasp of tactics and are known to be very adaptive and innovative, war being seen as a contest to show which commander can most cleverly outmaneuver their foes. 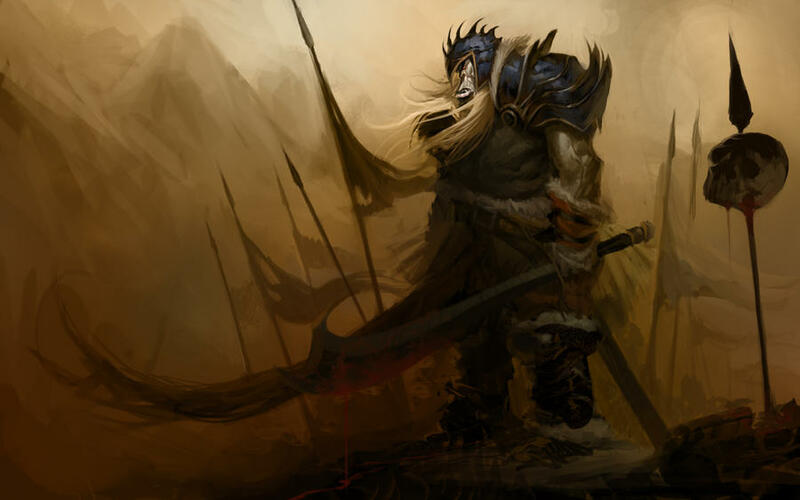 As a result, while many orc tactics are inefficient and many effective ones fall out of use simply due to the fact they are not passed on, most commanders hate dealing with an orcish commander simply for the fact it's very difficult to predict their tactics, as each commander has their own unique and independent style. Besides relying on warriors in-combat, Orcs have learned to ride many different and large beasts, tame several others to release in combat, construct simple war-machines, and utilize effective magic. Most orcish magic in combat involves either increasing the strength of their warriors, summoning creatures to fight alongside them, or, in times of siege, earthen magics to help destroy such fortifications when the catapults and mangonels the orcs favor in battle prove not to be enough.